San Francisco's Golden Gate Bridge serves as the iconic symbol of the "City by the Bay." It is one of the most visited attractions and visitors love photographing it, walking across it, and learning about Golden Gate Bridge history. It's one of the world's most beautiful spans. The real "Golden Gate" is the strait that the bridge spans. It was first named "Chrysopylae," meaning "golden gate," by Captain John C. Fremont in 1846. South (San Francisco Side) Vista Point: Parking spaces are almost always full, spaces are metered and if you let the meter expire, you'll pay a fine that could cost as much as a meal in a very nice restaurant. You'll find restrooms, a gift shop, cafe, and an exhibit showing the cross-section of a bridge cable. Drive away from the metered lot and turn left out onto Lincoln. You will find a gravel lot a short distance away on your left. If you are approaching from the Presidio on Lincoln, the lot is just across from the two-story houses that were once the Presidio officer's quarters. Weekends and holidays ONLY, you'll find more paid parking in a nearby satellite lot on the southwest side of the bridge. From there, walk toward the bridge and through the underpass to get to the vista point. North (Marin Side) Vista Point: Parking is free for up to four hours and there are restrooms. This lot is accessible only from northbound US 101 and if you drive across the bridge and plan to go back into San Francisco afterward, you'll pay a toll. The toll booths are all-electronic, so it isn't quite so easy as pulling out some cash. Find out how to pay in the Golden Gate Bridge Toll Guide, which is written with an out-of-town visitor in mind. Walk onto the Golden Gate Bridge if you can. You can't really appreciate the size and height unless you've walked on it, at least a little way. At mid-span, you stand 220 feet above the water's surface and passing ships below look like small toys. The distance from one vista point to another is 1.7 miles, a fun round trip if you're up to it, but even a short walk will be interesting. Pedestrians are allowed only on the east (city side) sidewalk, during daylight hours. Dogs are allowed as long as they are on a leash at all times, but roller blades, skates, and skateboards are not. Guided Tours: Many San Francisco tour operators include the Golden Gate Bridge in their tour itineraries, but most allow only a few minutes to get out at the south vista point. City Guides offers regular, free walking tours. Stroll with them and learn who named the bridge, how the structure cheated the law of concrete and steel, and what members of the Halfway to Hell Club did to join their organization. Even if you don't take that guided tour, you may want to learn more about the Golden Gate Bridge's history and find out some of the most fascinating facts about it. The Golden Gate Bridge is open to auto and bicycle traffic 24 hours a day and to pedestrians during daylight hours. There is a toll to drive across it, but in the southbound direction only. Allow half an hour to visit one of the vista points, an hour or more if you take a walk on the bridge. The Golden Gate Bridge is especially beautiful on a sunny day with no wind. In the morning, the east side will be nicely lit. Fog can make it nearly disappear. You can see the Golden Gate Bridge from many points in San Francisco, but if you want to get a closer look, there are a lot of ways to do it. Golden Gate Bridge by Automobile: Follow the signs from anywhere in the city, taking Lombard Street (US Hwy 101) west. To reach the south vista point, take the exit marked "Last SF Exit," just before you get to the toll booths. You can avoid busy traffic by taking Lincoln Avenue through the Presidio. Golden Gate Bridge by Trolley: City Sightseeing's "Hop On Hop Off" double-decker buses stop here as well as other sights. Other similar-sounding services do not stop at as many places or offer as much flexibility. Golden Gate Bridge by Bus: San Francisco Muni's #28 and 29 buses go to the south side. Consult the Muni System map to plan your trip. Golden Gate Bridge by Bicycle: Bicycles can use the Golden Gate Bridge 24 hours a day, but which sidewalk they're allowed on varies, with the west (ocean) side being most common. You can find several bicycle rental companies around Fisherman's Wharf, and most will give you a map and instructions on how to bike across the bridge to Sausalito and return by ferry. Middle span: 4,200 feet (1,966 meters). There are about 600,000 rivets in EACH tower. One of the most interesting Golden Gate Bridge facts is that only eleven workers died during construction, a new safety record for the time. In the 1930s, bridge builders expected 1 fatality per $1 million in construction costs, and builders expected 35 people to die while building the Golden Gate Bridge. One of the bridge's safety innovations was a net suspended under the floor. This net saved the lives of 19 men during construction, and they are often called the members of the "Half Way to Hell Club." Average crossings: About 41 million per year, counting both north and southbound crossings, compared to 33 million crossing the first year it was open. Currently, the bridge carries about 112,000 vehicles per day. Total crossings: As of January 2014, 2,025,883,491 vehicles have crossed the Golden Gate Bridge (northbound and southbound) since the bridge opened for traffic on May 28, 1937. Closures: The bridge has been closed three times for weather, for gusting winds more than 70 mph. It closed briefly for visits by President Franklin D. Roosevelt and French President Charles DeGaulle. It was also closed on its fiftieth birthday. The bridge was closed in the early morning for four hours in January 2015 to install a moveable median. September 2, 2008: Toll increased to $6 southbound. No northbound toll. April 2013: Human toll takers were replaced with an electronic system. This guide has all the details about the new way to pay Golden Gate Bridge tolls. The Golden Gate Bridge, symbol of San Francisco, engineering marvel, subject of many photographs, the result of one man's vision and persistence, spans the entrance to the San Francisco Bay. 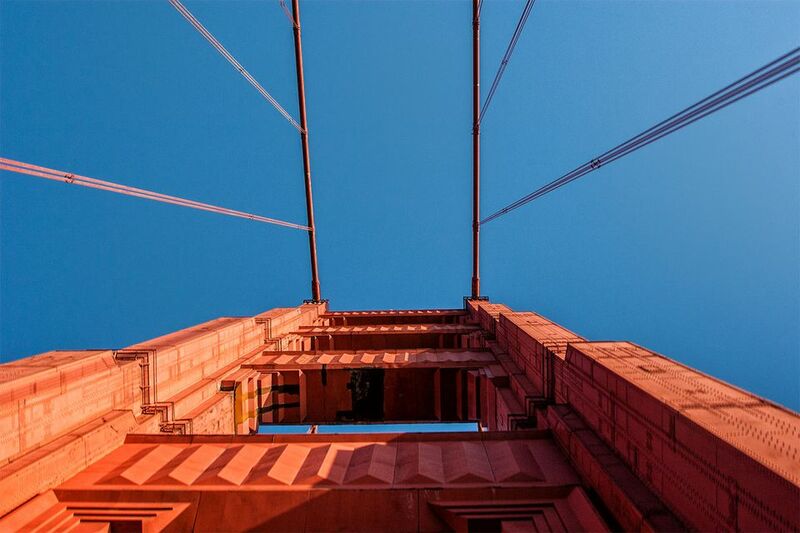 Learn a little about Golden Gate Bridge history. For many years before the Golden Gate Bridge was built, the only way to get across San Francisco Bay was by ferry, and by the early twentieth century, the Bay was clogged with them. In the 1920s, engineer and bridge builder, Joseph Strauss became convinced that a bridge should be constructed across the Golden Gate. Many groups opposed him, each for their own selfish reasons: the military, loggers, the railroads. The engineering challenge was also enormous—the Golden Gate Bridge area often has winds of up to 60 miles per hour, and strong ocean currents sweep through a rugged canyon below the surface. If all that wasn't enough, it was the middle of an economic collapse, funds were scarce, and the San Francisco Bay Bridge was already under construction. In spite of everything, Strauss persisted, and Golden Gate Bridge history began when San Francisco voters overwhelmingly approved $35 million in bonds to construct the Golden Gate Bridge. The now-familiar art deco design and International Orange color were chosen, and construction began in 1933. The Golden Gate Bridge project was completed in 1937, a prominent date in San Francisco history. Strauss was a pioneer in building safety, making history with innovations including hard hats and daily sobriety tests. The Bay Bridge (which was being built at the same time) lost 24 lives while the Golden Gate Bridge lost only 12, an outstanding accomplishment in an era when one man was killed on most construction projects for every million spent.